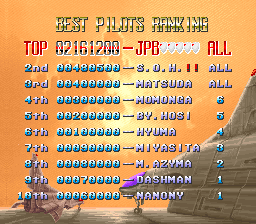 shmups.system11.org • View topic - Super/E.D.F. Last edited by Despatche on Thu Feb 28, 2019 12:31 am, edited 15 times in total. 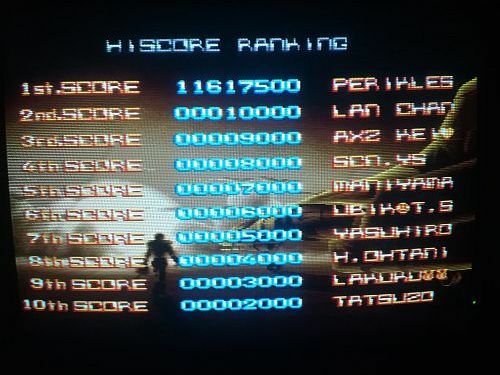 I have only played the SNES version, and I recall I used exclusively homing + photon on the last stage. Below I have included the stage numbers in parentheses. First time seeing stage 4. The bit before the colony scales in straight up destroyed me, then I was doing well until I cornered myself during the boss's second phase... kinda scared to see what this stage is like in the US version. Homing is almost as good as Thunder Force Hunter, so I don't see myself using anything else, honestly. Apparently you can't even play the game with a controller in port 2, so don't worry about that field for Super. How do the US/JP versions differ in actual gameplay? I'd love to know. I thought I tried the JP rom one day and didn't really notice anything different from the days I played it as a kid. The US/EU version is a sort of "version 2". The music was changed slightly (a better instrument was used), settings were changed (Easy difficulty is gone, shields go from 3~1 instead of 3~5), and what is probably the most drastic: totally different enemy patterns everywhere. 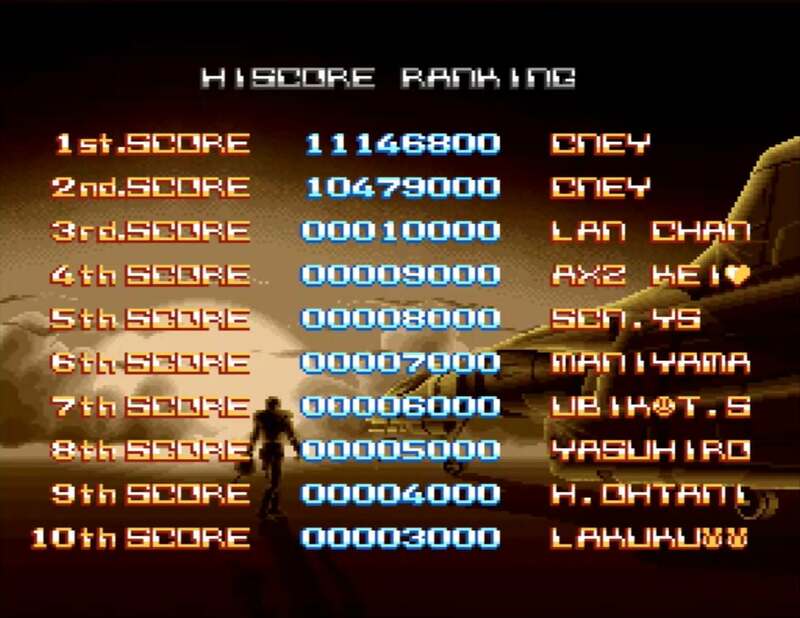 Also fun fact: apparently the stage 1 theme is from an older Jaleco shmup by the same composer: Big Challenge! Dogfight Spirit for the FCDS. 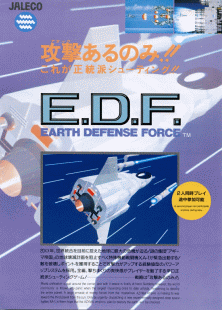 E.D.F would be the arcade version correct? 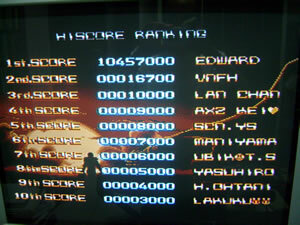 I'm not sure why the submitted scores for the Japanese version are on Easy difficulty. I played the Japanese but on normal. You don't get the fourth and fifth shields when you level up over level 5 in the US/EU version? That doesn't sound like change for the better. that just refers to the config menu. you can only select 3, 2, or 1 shields to start with in the us version. not important for the boards, but since i was listing changes between versions, i thought i'd mention the config changes too. although considering all the other changes, you may actually not get the extra bars in the us version anyway. i've never actually checked, or even thought about that. lol something just occured to me that isn't a big deal, but iirc arcade version already had a locked in auto fire rate correct? I assume autofire on/off was just a thing for the SNES port or something? 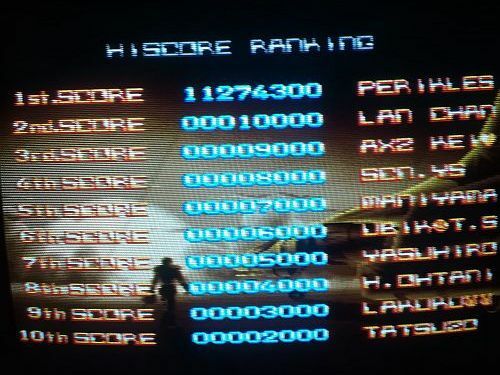 Because I just realized I definitely never messed with autofire settings for the arcade version and haven't played the SNES version. Oh. No, you can get an even higher rate of fire in the arcade version. Oh, well in that case autofire was off for what it's worth. This game seems to get better every time I play it. Used to not like it the very first time I tried it, but it grew quite a lot on me, probably one of my most played shooters on the console. 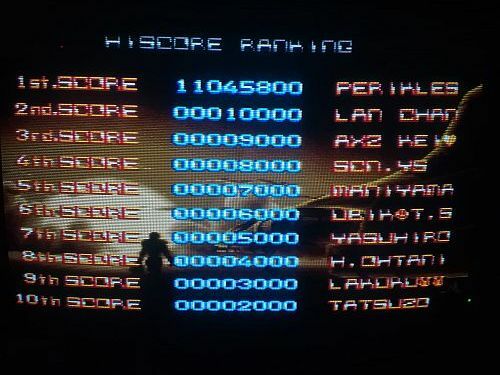 It's not that trivial to get a better high score, you miss one or two enemies in the final stage and lose out on several ten thousand points. I make sure to check out the arcade version in the near future, looks like an interesting game, too! Played with the Vulcan/Valcan for the first five stages and picked Atomic for the last one. I played with autofire moreso out of habit, but I concur with Emuser that it's pretty much negligible, at least with the weapons I picked. Run got a bit hairy at the end, messed up at the fifth boss as usual and also managed to get hit by the final boss since I parked the ship in the wrong spot, bringing myself down to the last hit. I'm fairly impressed with how creative you can get at some tricky spots, there are more execution-heavy solutions as well as memorization-inclined ones, one might not think that from just looking at the game. It's a bit of a shame that the search command for the options is not completely reliable, sometimes they kill all the robots that come from behind in the final stage, sometimes they don't. Oh well. Fixed. Seems I forgot to correct the formatting anyway. 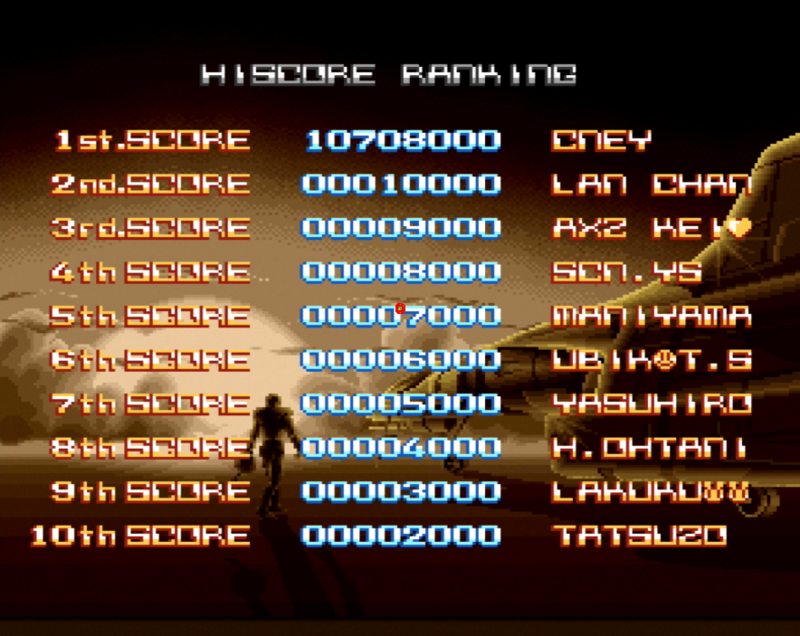 Also, Plasmablood's Hard run is miscategorized. I searched for it on YouTube, and it is most certainly the JP version, not US. You can immediately tell due to the first formations in stage 1. Thanks for that, and for the new score! Got a real contender here. I randomly decided to take a whack at the JP version of the game tonight (pretty much the 2nd time I've ever played it)... and ended up with 1CCs for all 3 difficulties. Awesome, this is exactly what I was hoping for. If anyone thinks the difficulties are redundant, I can remove them, but then I'd want to keep Hard instead of Normal. Resorted to using SNES Classic for US Hard Mode after suspecting that my suboptimal RCA->DVI adapter setup was proving a hindrance. I'd like to do this on cart at some point when I have a better setup. 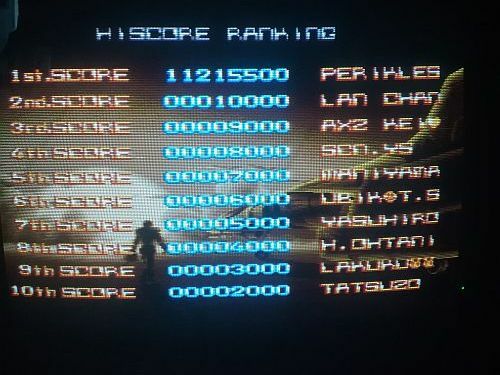 As mentioned elsewhere, I've been playing quite a few 16-bit games lately, I might post some of my scores in the upcoming days/weeks. Let's start with this one, I had a blast going through all the different difficulties/versions!